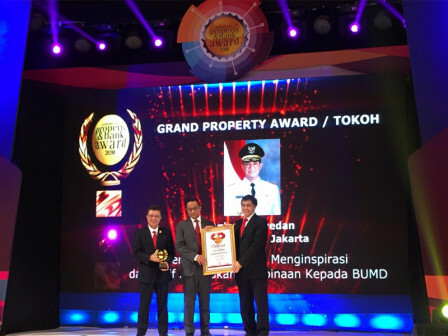 Jakarta Governor, Anies Baswedan achieved Grand Property Award at Indonesia Property and Bank Award XIII 2018 event, held in Hotel Mulia's Ballroom, Central Jakarta, Wednesday (11/21) night.
" One of the biggest challenges is to make mass public transportation that can transport more residents in Jakarta and its surrounding areas"
Anies achieved an award in category of inspirational leaders who are actively fostering Regional-Owned Company (BUMD). He admitted, it is a long struggle in managing BUMD, especially in mass public transportation integration. "One of the biggest challenges is to make mass public transportation that can transport more residents in Jakarta and its surrounding areas," he conveyed after receiving the award. According to him, current ratio of private vehicle users in Jakarta is still 75 percent and 25 percent for public transportation. "But, for the first time in Jakarta's history, all public transportation administrators want to cooperate with government. They want to be integrated in a network that we called Jak Lingko," he conveyed. He asserted, this award is the initial achievement to encourage BUMD administrators to work harder. "Hopefully our plan to build mass public transportation in Jakarta can run well and o ur BUMDs will be the vanguard," he expressed.